Now there is some inside stuff. It's like a jazz sutra. Thanks Tairaku! "Make the drummer sound good." It's like a jazz sutra. Agreed. 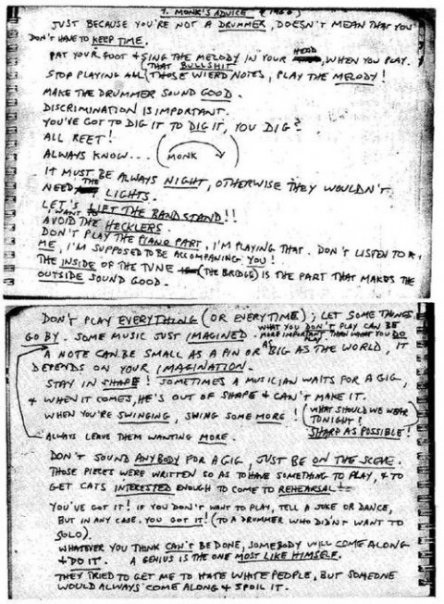 There is a wealth of musical wisdom in these spontaneous notes. I especially like his emphasis to leaving some emptiness in the song. DONT PLAY EVERYTHING (OR EVERYTIME); LET SOME THINGS GO BY. SOME MUSIC IS JUST IMAGINED. Nothing is more hideous than a nonstop and constant flow of crowded notes, in some kind of frenzied race from the very beginning, to the the end of a tune. Without proper phrasing and significant pauses, it's a tangle of noise. Even the musical surrealist Captain Beefheart understood that, irrespective of the bizarre cacophony he wove, with his... err... "music"(?). I learned early on that such genius players as John Coltrane and Rahsaan Roland Kirk... would rise, build intnesity, include stops and fall away, within the design of their wildly explosive solos. Even the eye of a hurricane has a central fulcrum of stillness. Intense virtuosity can be a wonderful accent in a song... but for me, it must be tempered with empty space, moments of silence and refrain. Everything in nature reflects this truth, so why shouldn't musical composition and free improvisation? THE INSIDE OF THE TUNE (BRIDGES) IS WHAT MAKES THE OUTSIDE SOUND GOOD. Absolutely. This is a very deep observation about musical composition and/or live performance, as well as the existential parameters of any human being. No wonder I love his music so much!!! Mr. Monk was one cool cat. "Stop playing all those wierd [sic] notes, play the melody." 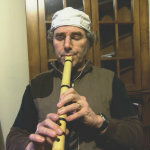 Hey Melodious, those weird notes are a shakuhachi player's bread and butter.